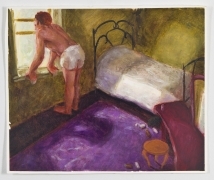 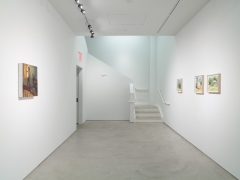 Alexander Gray Associates presented an exhibition of work by Hugh Steers (b.1962, Washington, DC – 1995, New York), including paintings and works on paper produced between 1990 and 1992 that exemplify Steers’ virtuous use of light and color to render allegorical and humanist images. 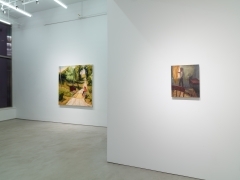 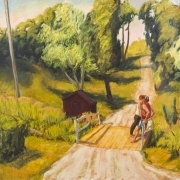 The featured works illustrated his creative process of working through ideas and formal concerns by generating expressionistic oil on paper sketches before painting larger compositions on canvas. 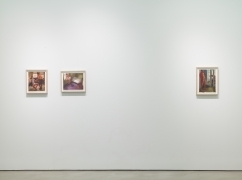 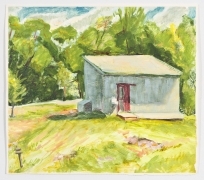 The exhibition positioned Steers’ residency at Skowhegan School of Painting and Sculpture in the summer of 1991, as a turning point in the artist’s practice. 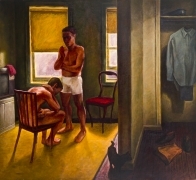 Through the 1980s, Steers painted interior scenes as he gradually developed an aesthetic characterized by vivid colors. 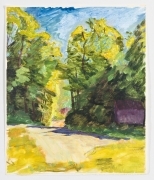 While at Skowhegan, he turned toward outdoor landscapes, brightening his color palette and emphasizing the presence of natural light. 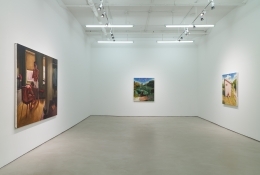 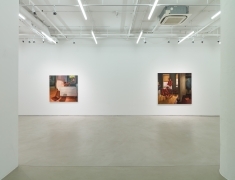 The works on exhibit reveal Steers’ ability to render light through color, often suffusing his scenes with the confluence of both natural and artificial light references and resulting in visually powerful scenes imbedded with a heightened intimacy. 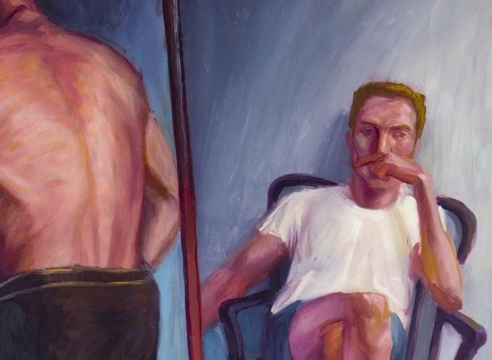 Primarily depicting isolated solitary figures or couples, Steers presents the viewer with ambiguous and disconcerting scenes, suggesting, but not fully defining narrative content. 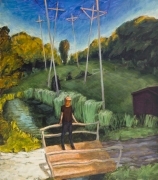 In Telephone Poles (1991), created at Skowhegan, the plunging perspective of a simultaneously bright and shadowed bucolic landscape centers on a lone male figure with a bag over his head, dwarfed by skewed and looming telephone poles. 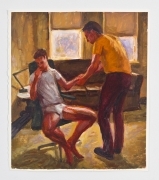 Diagnosed in 1987 with HIV, Steers’ subject matter often speaks to the experience of living through an evolving Queer identity and the devastating AIDS crisis. 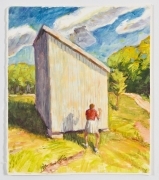 Much of his work addressed illness, isolation, alienation, companionship, and sexuality, as embodied in Maroon Shed (1991), also done during the summer Residency. 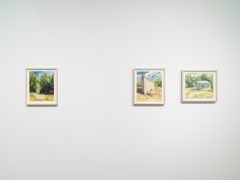 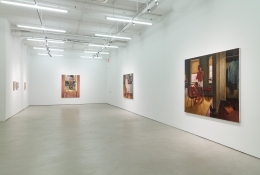 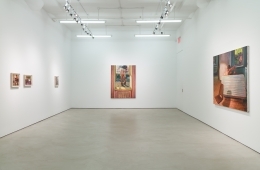 While he described his images as “metaphors that come from very specific needs and things on my part,” he repeatedly insisted that the meanings of his paintings depended on what the viewer brings to them. 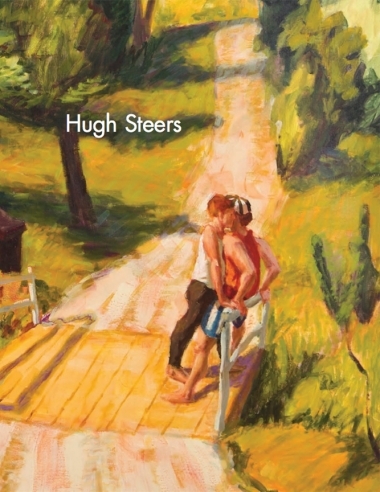 For Steers, his work powerfully embodies the clash between mass culture and personal instinct.